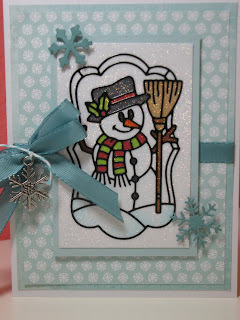 Stampin' With Shan: Can It Get Any Better Than Glitter? Can It Get Any Better Than Glitter? I spent my afternoon playing around with a new technique. I saw a video on Youtube by Elizabeth Crafts and I knew I had to try it. Why? Because it involves two of my most favorite crafty components. Glitter (Do we need anything else really?) and coloring with my Copics. It just doesn’t get much better for me. What do you think? Can you see that the entire image is glittered? I peeled off the back side of the sticky paper and laid it on a piece of white card stock. Then I peeled off the front side of my sticky paper, now adhered to the card stock. Next I peeled off my black peel off sticker outline and carefully laid it onto the exposed sticky faced card stock, sticky side to sticky side. Then I covered it in glitter, rubbed, or burnished it in, really well and then brushed it off. Voilá!! A glittered image perfect to color with your Copic, or other alcohol based, markers. This was SNOW much fun to color. Watch for more glittery samples and info about my upcoming class so you can make your own glitter flowers! Thanks for stopping in! Hope you enjoyed! Love the technique!!! Cute snowman and he has holly on his hat 😀. I will be signing up for the glitter flower class. So cute! Can't wait for a class on this technique.